Ballpark Basics: A historic field supported by two small towns, and one really loud announcer. 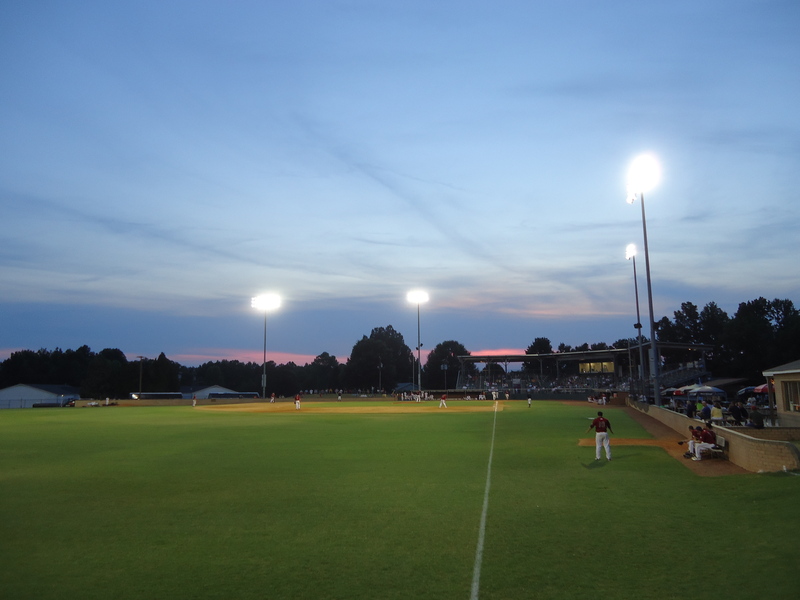 Ballpark Breakdown: Named for the two towns that surround Finch Field –High Point and Thomasville – the Hi-Toms have played in Carolina State League and the Carolina League and have served as the affiliate for the Cincinnati Reds, Philadelphia Phillies, Minnesota Twins, and Kansas City Royals. Today they are a member of the Coastal Plain League, a summer wood bat collegiate league. 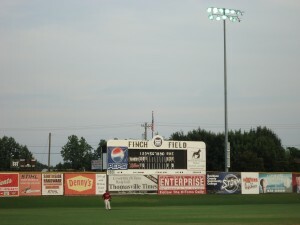 Finch Field is named after the founders of Thomasville Furniture Industries, T.J and C.F. Finch, who built the park in 1935 as a recreational outlet for their employees. In the years since, Finch Field has seen its share of baseball history. Hall of Famer Eddie Matthews got his start here in 1949 at the age of 17. Curt Flood began his playing career here, along with 42 other Hi-Tom alums who have made it to the Bigs. While the original field is still in use, there isn’t much else left from 1935. Professional baseball left Thomasville in 1970 and Finch Field fell into neglect. It stayed that way through the 70’s and into the 80’s until arson claimed the original grandstand in 1983. 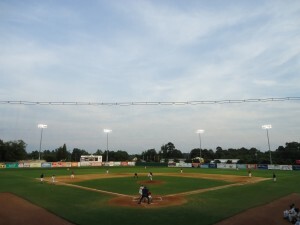 The Coastal Plain League came back to Finch Field in the mid-80’s to a much more modest park. The grandstand consisted of three sets of bleachers perched on a cinder block grandstand. 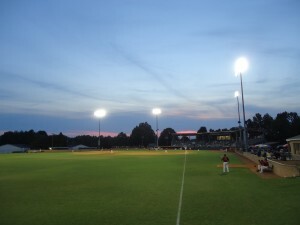 (You can see what Finch Field used to look like at ballparkreviews.com . 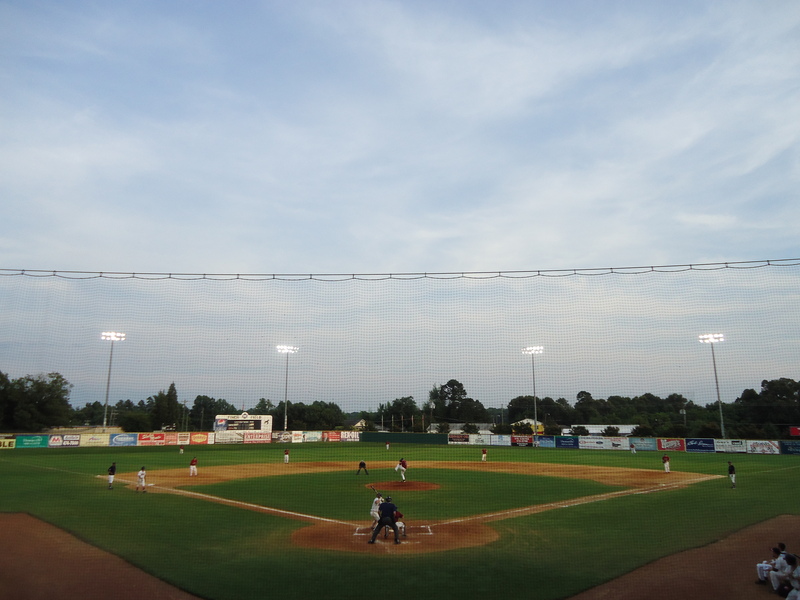 Then in 2001, local businesses (including Thomasville Furniture Industries) worked with the City ofThomasvilleto give the ballpark a first renovation. This included new lights, fencing and the patio grill down the left field line. 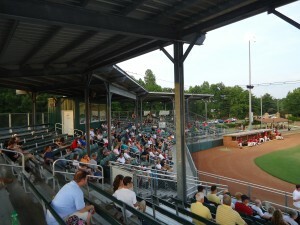 In 2005 they completely rebuilt the grandstand, built new dugouts as well as new bathrooms and concession areas. The kept the traditional grandstand form, with seats behind home plate and four rows along the baselines. The rest consists of bleacher seating. The press box was also renovated in 2005 and is now enclosed and air-conditioned, a blessing for the announcers on those muggy North Carolina summer nights. There is grass hill down the first base line where many people set up chairs (and even a tent!) to watch the game as kids play around them. The most unique aspect of the park has to be the embankment in left field. Just like Minute Maid Park and Crosley Field before it, there is a small hill in play that stretches from the left field foul pole all the way to center field. It always makes for an interesting play when the left fielder has to navigate the hill while chasing a long fly ball. Another distinctive aspect to Finch Field is the small manual scoreboard in left field. Along with these distinguishing features, the Hi-Toms Number One Fan sits right behind home plate (where he has obviously been for many, many years) and helps get the crowd motivated by reciting how many outs there are and encouraging the fans to cheer along. All of these aspects give Finch Field a very traditional feel. However, as they have modernized the stadium, they have also tried to modernize the experience. The sound bites coming over the loudspeakers are continuous, between every pitch. Literally, between every pitch there is some movie line or crazy whistle. The volume of these sound bites is so loud it is actually uncomfortable to watch the game. We tried to seek refuge down the third base line where they have a bar and patio area but this did little to help since we could hear them in the parking lot when we walked up. Overall, this field is not typically on the radar of most fans being A. in a small town, and B. collegiate level but it is a historic field that is home to a storied team and definitely worth stopping by – especially if they rethink their play by play sound effects. Brew Basics: A chain that isn’t as big as Gordon Beirsch, but is hoping one day to be. 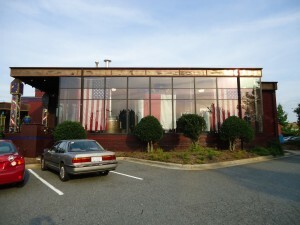 Our initial impression was that this was a pub that had started in Myrtle Beach, and expanded to High Point, in reality, this place is established in multiple cities (using various versions of the Liberty name) throughout the Carolinas. The servers didn’t seem too interested in working there, and the hostesses, even less. Any time a customer entered they immediately asked if “you wanna sit at the bar?” and they’d shoo you in to find your own seat, and a server to get you menus and silver. 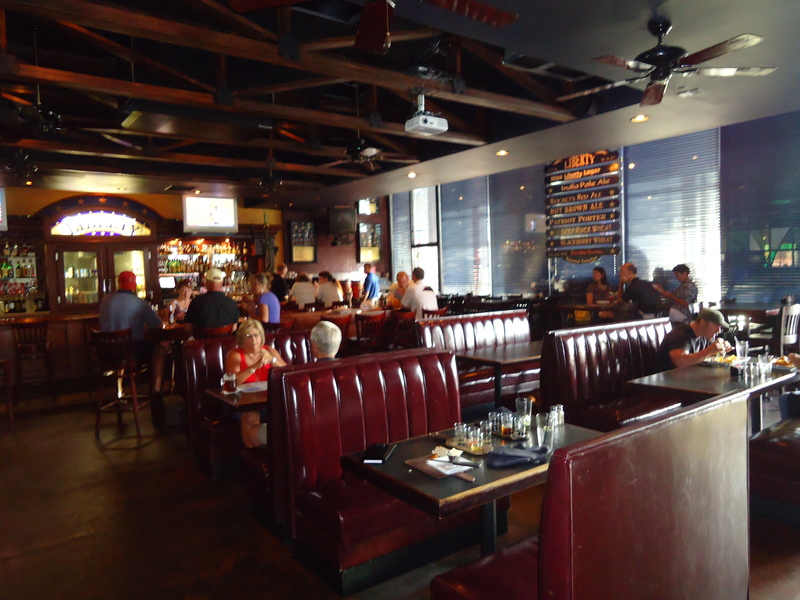 This did give the bar a pretty decent crowd – and atmosphere – in that awkward mid afternoon time that is too late for lunch and too early for dinner…even if the bar patrons were a bit older, and younger (there was a toddler roaming around) than your typical. The decor was kind of typical for a nicer Applebee’s/Ruby Tuesday type place, and designed for a crowd. The booths were large, and most could happily seat 6 adults. There was a long bar, and a secondary one, just a long, and with even more seating, right behind it. 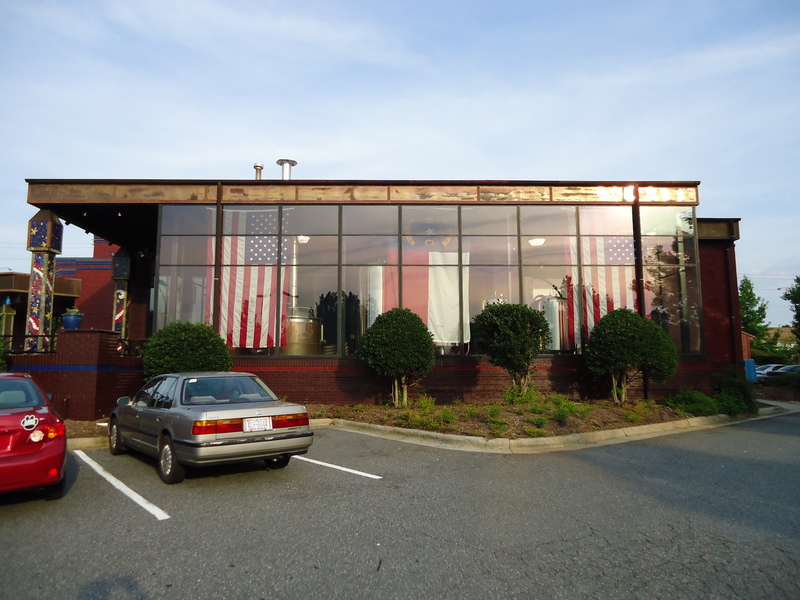 Huge American and N.C. state flags hung on the outside over the huge brew works windows, and the red, white and blue Statue of Liberty/bald eagle motif was displayed on muraled pillars in the outdoor seating area and all throughout the bar. The sole exception to this was a large wall of colored glass – which was inexplicably green and brown – and served to separate the bar and restaurant rooms. The food was better than expected, actually really delicious, the beer was not. Really the beers weren’t bad and a couple might even qualify as “good”, but overall the recipes are very simple and plain, probably to cater to as much of a small town mall crowd as possible. On the plus side, this makes Liberty a good place to initiate yourself into craft beer, since it is one of those places that will probably have something off their own taps comparable to what you traditionally drink. It’s even a good place to initiate yourself into the basics of brewing – especially if you’re not yet up for a tour – since the brew works are enclosed but close and easy to see from any seat in the bar, and each piece is clearly labeled (i.e. “bright tank”, “mash tun”) so study up while you drink. Miss Liberty Lager (4.3% ABV)- Light apple juice color, and lightly carbonated – especially for a lager. They advertise their “extended aging” of this beer, but we are not sure what it does; the ABV isn’t any higher than usual and the milder taste is comparable to many macro-brews on the market. Overall Miss Liberty has a traditional American lager taste, and is an easy drinker without a lot of risk. India Pale Ale (7% ABV)- Pretty orange hues, give this beer almost a peachy/mango color, and it’s so hazy that you might assume that it was unfiltered (but it’s not!). Strong hops come through in the aroma and flavor that is bitter with a lingering aftertaste – in a good way. One of the best selections we tried at Liberty. Dry Hopped Kellerbock – Smells of thyme and sage. A dry hopped beer with a solid, slightly earthy taste. It is thicker than similar Belgium beers with fairly high carbonation and had strong hops, but not like what you’d find in their IPA if you’re trying to make a comparison. Rockets Red Ale (6% ABV)- Given the pink and orange hues of some of the other beers on tap here, this red is surprisingly, not. It has more of a sienna brown color, medium body, and is one of the higher carbonated options. Rockets Red smells of rye and toasted malts, which come through tartly in the palate, and finish clean. Overall, not great. Nut Brown Ale (4.6% ABV)- This beer has a rich brown color, and solid slightly thicker taste. While they promote chocolate malts and a toffee finish with this one, in our opinion it was mainly a nutty coffee that comes through in the aroma, and is also the dominate flavor throughout the sip. Patriot Porter (5.7% ABV)- A very, very dark brown beer with those pretty ruby tones. There is a roasted malt smell, but this porter is thin, both in consistancy and taste. The porter flavor is there (coffee, malts, molasses) but it’s fleeting. Deep River Wheat (5.4% ABV)- This very yellow beer is so hazy that it is almost opaque. Unlike many wheat beers, this one doesn’t even have a hint of fruit, and really all that comes through is the wheat smell, which isn’t surprising since this one’s recipe is actually 50% wheat. Blackberry Wheat – A beer that is the exact color of pink grapefruit juice, but didn’t have an overpowering berry smell. Don’t get us wrong, the berries are easy to identify in both the aroma and palate, but compared to the overwhelming fruit beers of our recent reviews, we had kind of put off tasting this one, and were pleasantly surprised to find this one is subtle at first, with pronounced fruit aftertaste. Still, this is one we could only drink in smaller doses. Belgium White Ale – A highly carbonated beer that is almost identical in color to the kellerbock, and just slightly hazier. This Belgium is very flavorful, with wheat, thyme and coriander blending together to form a tart, refreshing and slightly dry beer. 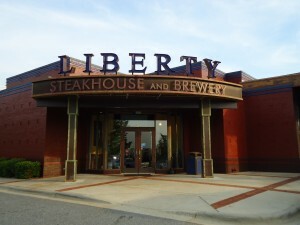 *Note: the ABV percentages were not on display anywhere in Liberty, and could not be found on their website. Those we could find come courtesy of BeerAdvocate, another great beer rating site!